Jock Stein once said that, everything he knew about football, he learnt in the pits. The importance of teamwork, the effect of camaraderie. Given that background, there are a lot of easy metaphors about diamonds in the rough and rising out of the darkness. But then they are also entirely apt metaphors. Stein’s managerial career was initially marked by delivering teams to unexpected and unprecedented success. On taking over at Dunfermline in March 1960, he immediately saved them from relegation and then steered them to the first trophy of their history – the 1961 Scottish Cup. Such was his high-flying effect on Hibernian, then, that Stein didn’t even finish a full season before Celtic swooped. And, in 1967, he famously lifted a group of largely local boys to the continent’s greatest stage. Even more impressively, he did so by changing the history of football tactics. The manner in which Stein’s Celtic overwhelmed Helenio Herrera’s Inter banished the Catenaccio strategy which had strangled Europe for almost a decade. Ironically, the tables would be turned on Celtic three years later as Feyenoord claimed the 1970 European Cup with Ersnt Happel’s tactical trump cards. But the fact that Stein had yet again taken a team from the lower-regarded Scottish league to another final – and, indeed, another two semi-finals – was further testament to his ability. Stein couldn’t quite bring that effect to international football as he was unable to break Scotland’s first-round glass ceiling in the 1982 World Cup. Nor could he qualify for the European Championship of 1980 or 1984. But, tragically, as Scotland stood on the brink of passage to Mexico 1986, Stein died as he lived. At the age of 62, Stein suffered a fatal heart attack on the Ninian Park bench as his team secured the 1-1 draw they needed against Wales. In tragedy, there was still triumph. And, whatever of diamonds, few careers have sparkled with so many trophies. Like many of football’s greatest personalities such as Bill Shankly, Malcolm Allison and Ernst Happel, it can often be difficult to separate Jose Mourinho’s charisma from his exact career. And it is undoubtedly telling that the majority of his most memorable moments have come off the pitch rather than on it: the sprint down the line at Old Trafford, the ‘special one’ press conference, the celebration under the sprinklers at Camp Nou. And, certainly, it is highly doubtful as to whether any Mourinho team could ever achieve football as expansive or as exhilarating as the Catalans that night. Just like so many of those moments and almost every Mourinho quote, the majority of his management is calculated and mechanical. Indeed, it’s been argued of late that Mourinho isn’t a particularly innovative or inventive manager, devoid of imagination in both his approach and tactics. But therein lies his genius too. Despite the essential functionalism of Mourinho’s framework and formations, so good is his man-management that players often carry out their instructions to maximum and disproportionate effect. Few teams have been as driven or as focused as his Porto, Chelsea and Inter 2009-10 teams. Adding to this, few managers have been as meticulous as Mourinho either. Because of his approach to scouting, strategy and every tiny moment that goes to making up a 90-minute game, as little is as left to chance as possible. And that has ensured that Mourinho has been the surest thing in management since the dawn of this millennium. Without money he lifted Uniao de Leira and fired Porto to a Champions League. With it, he drove Chelsea to the two highest points-per-games record in the history of English football. While Mourinho was at Stamford Bridge, any opposition slip-up was fatal to a title tilt. And, although it is a mark against his record that he never won a European Cup with Roman Abromivich’s money, he made it up for it by emulating Happel and Ottmar Hitzfeld and winning the second of his career at Inter. Even in the shadow of this brilliant Barcelona, he has kept his record of a trophy every season going at Real Madrid. As such, there might be much to debate about his style. But not his stats. For most of the last seven decades, it’s been a great football truism that Real Madrid have never been about the manager. The position has largely just been that of a hired hand to preside over a continuing sequence of world stars. But there was one grand exception to this. Having been in charge of Real for a total of 15 years, Miguel Munoz was is the longest-serving manager in the club’s history. And that was far from a case of just languidly overseeing great players play. Munoz had to make some tough decisions. Most notoriously, there was the call to end Alfredo Di Stefano’s career at the club in 1964. But that still came in the middle of the club’s finest spell of domestic dominance with eight titles in 10 years. What’s more, despite the loss of such world-class stars as well as the gains the rest of Europe had made in catching up with Real, Munoz ensured they remained a continental force. The club reached a further two European Cup finals in the 1960s before a new team reclaimed the trophy in 1966. Although Munoz endured something of a barren period after eventually leaving the Bernabeu in 1974, he came closest to ending the national team’s. Munoz delivered Spain to three successive tournaments as the Euro 84 final. For 44 long years, it was the country’s best ever performance. But it is testament to Munoz that it was far from his. It was an odd response to a mere message of congratulations. But then Valeri Lobanovskiy elaborated on his unique reasoning. Having grown up and studied in the great Soviet age of science, Lobanovskiy’s definition of ‘perfection’ went far beyond the figurative meaning usually used in football. He meant it in a very pure mathematical sense. It was no surprise, then, that he would go on to develop such a model for football. Analytically viewing opposing teams as “two sub-systems of 11 elements each, moving with a defined area and subject to a series of restrictions, Lobanovskiy attempted to tilt the equation towards his own sides. Every position had set instructions to react to any given scenario. And the net result was remarkably akin to Ajax’s pressing game. So, occasionally, were the performances. In three separate spells at Dynamo Kyiv, Lobanovskiy won two Cup Winners Cups, 13 titles and – in 1999 in a much-changed Champions League – unexpectedly reached Europe’s last four. By then bringing across so many Dynamo players to the national team, he also brought similar success. Under Lobanovskiy, USSR gave their best performance in 16 years by reaching the final of Euro 88. Ultimately, however, football is a game of far too many variables. And Lobanovskiy couldn’t control them all. As such, another USSR team failed to qualify for Euro 84. And, despite their brilliance, Dynamo never got to a European Cup final. But the stats of Lobanovskiy’s career still add up to some astonishing achievements. For nine years, Paisley enjoyed a near-perfect managerial career. He remains the Champions League’s most successful coach with three trophies. And nor was it just a case of continuing another man’s work. Despite the foundations Bill Shankly had put in place and so much talk of the Boot Room, it is often underestimated just how much Paisley enhanced that culture. He was much more than a soft, safe pair of hands. If the history of Liverpool between 1959 and 1990 was one long period of evolution, Paisley’s appointment marked something of a Cambrian explosion. As stated elsewhere on this site, he turned a club that were regular winners into relentless winners. And he did so by unveiling an authoritative streak underneath an initially avuncular and occasionally incoherent exterior. This revealed itself in two areas. On a micro scale, there was his advanced acumen on how to use substitutes. David Fairclough’s super-sub reputation was as much down to Paisley’s nuanced knowledge of how a game would flow as the striker’s own qualities. On a macro level, there were the continental performances. Paisley gave Liverpool a much more patient and poised approach which resulted in Liverpool’s first European Cup and his own record of three separate trophies. That remains his strongest argument to be considered the greatest coach of all time. But there are two reasons why he isn’t. Firstly, despite the magnificence of that European Cup record, his season-to-season performances were actually quite mixed. In six seasons competing for the trophy, Liverpool went out in the opening round twice. But, while that may seem like a very minor caveat, there remains the larger one that he never repeated such success in any other job. And, yes, that may well be down to the fact he never had another job. But, despite his notable improvement of Liverpool, it remains impossible to tell how well he would have done in different circumstances. The same applies to Pep Guardiola at present. And, as such, it’s also impossible to put Paisley on the top of any such list. But then such words could also be used to describe his scarcely believable run of trophies. To a very significant degree, this entry should really have two names at the top – that of Clough and Peter Taylor. Certainly, it’s no coincidence that his greatest achievements came when his co-manager was complementing his qualities. Or that his worst failures – Leeds United – arrived when his erstwhile assistant was absent. Such was the overwhelming force of Clough’s personality, however, that it has taken belated accounts like the film of The Damned United to properly write Taylor back into the narrative. But it’s not just that notable charisma that makes Clough so unique. Although Otto Rehhagel later emulated Clough’s achievement of taking two provincial teams from the second division to a major domestic title – as he did with Derby and Nottingham Forest – no other manager has taken a promoted side to the continent’s prime trophy. And that Clough actually retained the European Cup while doing it all in such quick succession – four years between Second Division and second European Cup – makes it all the more incredible. To a certain extent, that success was dependent on the circumstances of the time: football’s less dramatic economics, the greater variety in competition. But, also, Clough’s magnificent man-management. On once taking a cop of Sigmund Freud’s The Psychopathology of Everyday Life off biographer Duncan Hamilton, Clough inadvertently revealed exactly how he did it. “I don’t need a boring book by Freud to show me how to [read people]. I’ve been doing it since day one in management. I can tell, from the moment I see someone in the dressing room, whether he’s off colour, had a row with his missus, kicked the cat or just doesn’t fancy it that particular day. I know who needs to have his arse kicked. I know who needs leaving alone to get on with it… It’s a special kind of coaching done only by very, very good managers – like me. The art of management is knowing your own players, and I’m not talking about whether someone has a better right foot than left. I’m talking about really knowing them, knowing what sort of person you’ve got on your hands. To many, the fact that Clough’s major successes actually ended at that last European Cup final detracts from his reputation. From 1980, he only ever won another two League Cups. But, to Hamilton, this period actually represented an achievement that was equal to his earlier alchemy. Having endured the breakdown of his relationship with Taylor, he then endured the complete breakdown of Forest’s finances. On the verge of bankruptcy, Clough had to do more than balance the books. And, despite the budget of a Third Division team, he did more. He built another side that challenged for the title. But it’s for more reasons than that that he is above them in this list. Had Giovanni Trapattoni not been so intransigent, then his trophy haul might be even more spectacular. An effective slave to the lop-sided il gioco all’Italiana formation in his early managerial career, that devotion meant Trapattoni had no answer to Ernst Happel’s simple positional switch in the 1983 European Cup final. With the elementary transfer of Hamburg’s Lars Bastrup from the left to the right, Juventus’s Angelo Cabrini was unable to roam forward and Marco Tardelli was all at sea. But, because such a move was unheard of in Italian football, Trapattoni stuck with the tried and tested. And Felix Magath ran through the gap to score the only goal. Such conservatism has been a criticism directed at Trapattoni throughout his career. Most notably in international football as his Italy got no further than a World Cup last-16 and Ireland a play-off. But the opposite side of that is that it is the application within such self-defined parameters that has propelled Trapattoni’s success. He is one of a select band to have won a league title in four different countries and the only manager to have won all three Uefa trophies with the same club. By applying a similar framework to each side and then relentlessly enforcing discipline, the results have often been resounding. As the game has moved on since his heyday, such abilities are probably no longer enough to win the biggest trophies. But it remains a testament to his quality that they keep his sides so competitive. Trapattoni may often refuse to change his mind. But there’s no changing that exceptional record. Of course, Matthaus had been comforted by Hitzfeld in the worst moment of his football life: Bayern Munich’s painfully late 2-1 defeat to Manchester United in the 1999 Champions League final. It is to Hitzfeld’s eternal credit that he managed to lift the core of that side to go and claim the trophy just two years later. But, by that stage, Hitzfeld had made a habit of such feats. Early in his career in Switzerland he had restored Aurau to respectability and won the domestic cup before breaking Grasshoppers’ six-year title duck. Finally back in his native Germany, then, he ended an even longer drought for Borussia Dortmund. Hitzfeld guided the club to their first league title in three decades before winning another and then a first Champions League. And, in doing so, he also forged one of the longest-lasting threats to Bayern Munich’s hegemony. Of course, within two years, he would then raise that to levels not seen since the ’70s. Hitzfeld was recently voted the best coach Bayern ever had and also the greatest in the history of the Bundesliga. Helenio Herrera didn’t quite land from the heavens to take charge of his teams. But he probably would have liked everyone to believe he did. Going by titles like ‘The Saviour’, ‘The Magician’ and ‘The Wizard’, Herrera had some equally outlandish techniques. Really though, despite the cynicism of the likes of Ladislao Kubala, Herrera’s idiosyncrasies were evidence of a manager ahead of his time. He was fastidious about diet and fitness while the rituals were actually primitive examples of sports psychology. When all of that was applied to a promising core of players, the results were revolutionary. So revolutionary, in fact, that many accused Herrera of trickery and outright doping. Critical journalists called him “the pharmacy cup coach”. Herrera always claimed such accusations came because doubters simply didn’t have the imagination to do what he did. But the later allegations at Inter Milan in the ’60s were a little harder to wave away. And the murmurs of match-fixing added to the generally malevolent air of Herrera’s greatest side. As well as such skulduggery, there was the ruthlessness and rigid football. Herrera might have created a supreme team, but also a very suspect one. Yet there’s also a certain irony to the fact he has become most associated with such a notionally defensive side. Because, just before then, he had created one of the most awesome attacking forces the game has seen. And mostly thanks to his own innovations. By placing inside-forwards in the normally defensive wing-half positions at Barcelona, matches would be turned into massacres. By the end of the 1958-59 season, Barcelona had scored 96 goals in 30 games as they romped to the Spanish league. In the next campaign’s European Cup then, they put eight past CDNA Sofia, seven past Milan and nine past Wolves as they also retained the title. The only problem was that demanded a response from a chastened Real – particularly after being routed in the league. Madrid would gain their revenge in the match that mattered most – the European Cup semi-final. Herrera lost the match and then his job. But, as well as changing country, Herrera also changed his approach. And, in doing so, he also became to only manager to enjoy such stunning achievements despite so radically altering his style. In that, there’s arguably no better proof of his prowess. Herrera didn’t have to rely on a set formation or philosophy. Rather he adapted to every scenario with emphatic effect. Even the titles at Barca were preceded by two at Atletico Madrid. And, since then, there have been very few coaches who have followed him. To properly put a list of achievements as lengthy as Alex Ferguson’s into context, it’s possibly best to illustrate the other careers that his own encompasses. First of all, he did a Brian Clough by breaking the Old Firm’s dominance of Scotland with Aberdeen and even winning a Cup Winners Cup with them. The Real Madrid side he beat in the final had reached the same stage of the European Cup just two years before. Secondly, he emulated Matt Busby and Bill Shankly by transforming Manchester United from a faded giant to a modern super-club. For those that cavil at the resources Ferguson has enjoyed in contrast to those past masters, it’s worth reflecting that he helped create them. Finally, he has long surpassed the likes of Bob Paisley, Giovanni Trapattoni and Miguel Munoz as a thoroughly relentless trophy winner. Indeed, there’s an interesting parallel between Ferguson’s time at United and that of Liverpool’s two giants. Collectively, Shankly and Paisley were at Liverpool for 24 years. In that time, they won three European Cups, nine domestic titles, two Uefa Cups, two FA Cups and three league cups. By comparison, Ferguson has been at Old Trafford for 25 years. In that time, he’s won two Champions Leagues, 12 domestic titles, a Cup Winners Cup, five FA Cups and four league cups. If anything, it illustrates the astonishing breadth of Ferguson’s career. Paisley, of course, has that extra European Cup that Ferguson doesn’t. And it’s that continental record that has always been the one major caveat to his CV. But, when pointed out, it’s also usually a caveat devoid of proper context. 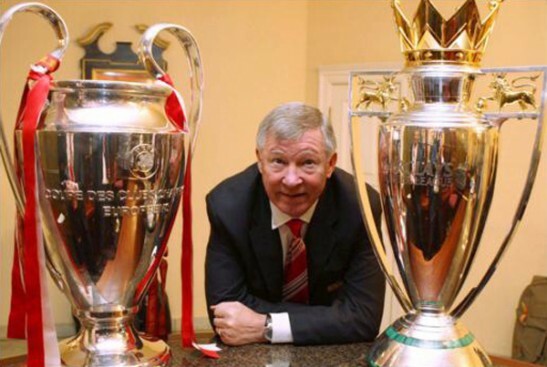 After all, Ferguson has still won as many European trophies in total as any other manager. What’s more, the exact length of his career has thrown up an unprecedented number of challenges. Having finally overcome the hangover from the Heysel ban, Ferguson then created his greatest teams during the most competitive period of the Champions League’s history. As barely needs repeating, no club has retained the trophy since Ferguson first entered the competition. They days of racking up rallies are long gone. And yet, still, Ferguson might have forged the European Cup’s greatest record had it not been for the rise of one its greatest teams. A brilliant Barcelona have now denied him twice. How Ferguson reacts to that challenge is going to be revealing. Because, so far, his career has been characterised by eventually beating off all-comers: the Old Firm, Kenny Dalglish’s Blackburn, Kevin Keegan’s Newcastle, Arsene Wenger’s Arsenal, Jose Mourinho’s Chelsea, Carlo Ancelotti’s Chelsea. He’s won almost every trophy possible in almost every way possible: with adventure, with caution, by romping home, by just making it over the line, with power, with poise. No other has proved as durable, as adaptable, as dogged or – ultimately – as successful. The fact he’s still competing for the game’s top prizes three decades after winning his first is the ultimate evidence of that. And the caveat that he’s not finished yet makes it all the more formidable.